About six months ago, I fulfilled a (minor) dream of mine to own the most beastly portable computer ever made. The Dell XPS M2010 is the bigger brother to my former laptop, the M1210. Instead of a 12.1″ screen, it boasts a 20.1″ screen, dual hard drives, eight speakers (small, and arranged under the LCD) and a faux leather exterior. These systems originally cost somewhere between $2500-$3500 depending how it was specced when they came out in 2006. I got to take apart a single one when I worked at the university help desk. It was magnificent. Fast forward 8 years and you can find them, occasionally, on eBay for $300-500. I picked up one for $350, but despite it working perfectly well for the first 4 months of ownership, it developed the chronic video card issues that plagued the model throughout its short life. Dell did their best to pretend they never made this computer (I don’t know why, as it’s awesome and all companies should make at least one new 18 pound portable computer a year) and unfortunately, replacement video cards are hard to find. Baking circuit boards to help reconnect solder wire traces is a fairly old technique. I tracked down this blog post, and noted with approval the large amounts of comments declaring that the attempt had been a success. I used this PDF straight from Dell’s FTP website to figure out how to take apart the computer again (hey, a lot’s happened in the past 8 years since I last disassembled an M2010). I’m including some high resolution photographs, as the owner of the above blog post lost his somehow. Usually I host my own photos on my own host, but due to the age of my hosting plan, I don’t have enough RAM on my hosting server to upload high-resolution images through wordpress, so I’ve decided to do everything through Imgur this time. You can view the album directly here if you prefer to share that with other people. 6 philips-head screws on one side, 7 on the other. The arrows show where you have to push a flathead screwdriver blade in to release the cosmetic covers. It’s quite easy to take the M2010 apart. 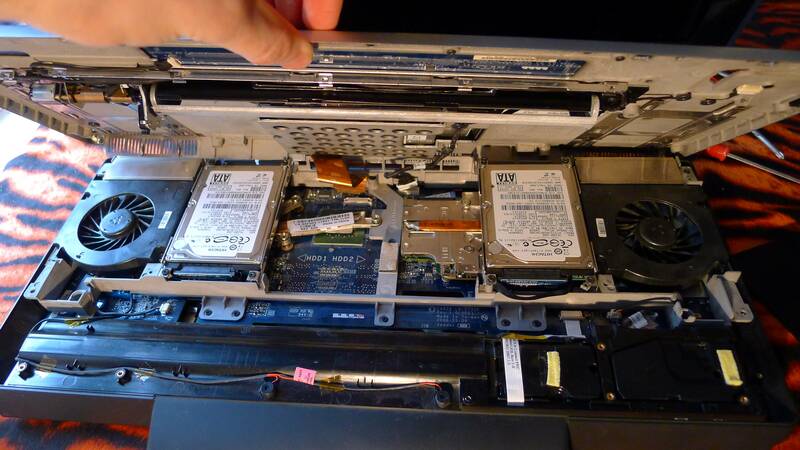 Sliding a flatbladed screwdriver into the vertical slot on each back corner allows you to pull the top cosmetic plastic pieces off, exposing the screws that actually hold the top of the computer on. Once those 13 screws are removed, you can simply lift the top right off, while being careful to disconnect the two cables that run between the top case and the motherboard. The two cables are the flat orange cable to the DVD drive, and the other is thin and black, and connects to all the buttons on the top case. Four black philips screws hold the hard drive cage onto the casing, right above the GPU. For heat purposes, you might consider replacing this drive with an SSD, or removing it entirely if you can get by with one. 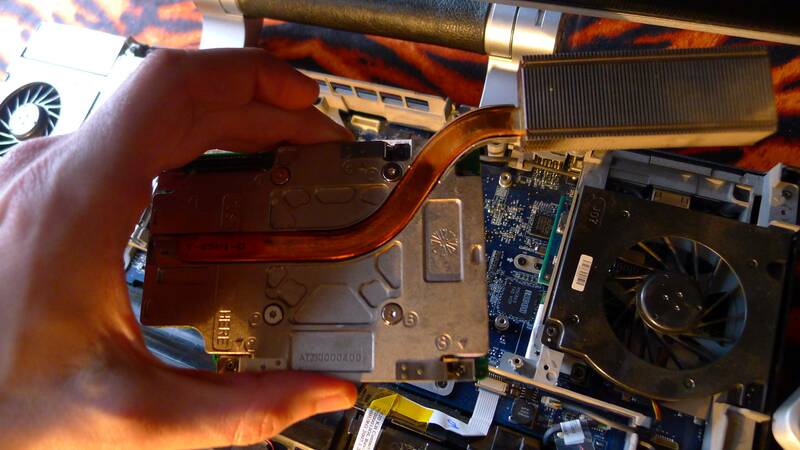 Then remove the 2nd hard drive, and you can access the large GPU and its heatsink underneath. Four screws hold the assembly onto the motherboard. My trusty T6 and T8 screwdrivers have been on three continents with me. The torx screws are spring-loaded – as always, make sure to undo and redo them by the numbers stamped on the heatsink. Every time I see corporate thermal paste, it strikes me as “lowest bidder” level stuff. Put some Arctic Silver or IC Diamond on it instead when you’re done! Paper burns at Fahrenheit 451, which is also an excellent novel. But even though we’re using 300F instead, better safe than sorry. The stickers come off easily. I didn’t put them back on when I was done, either, because I live dangerously. 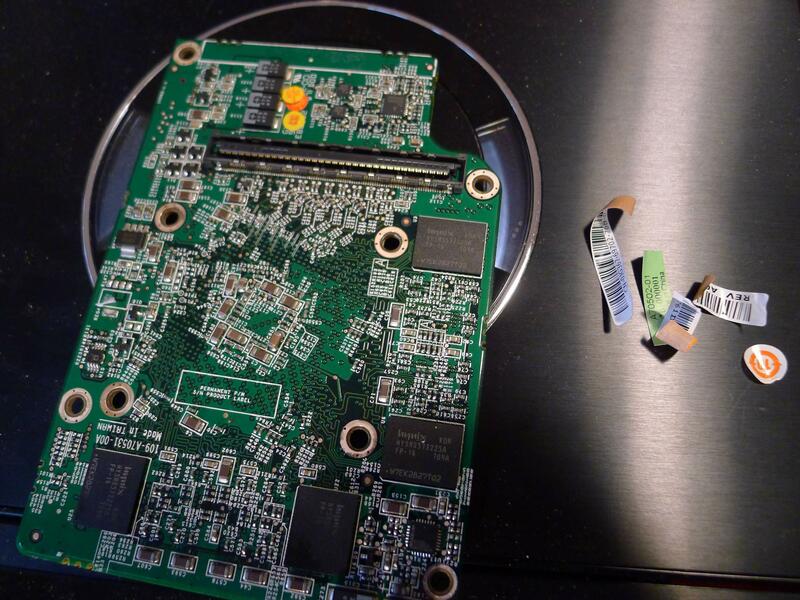 Once removed, you need to use a Torx T8 screwdriver to separate the “sandwich” of the bottom plate, the circuit board itself, and the main heatsink. Use some rubbing alcohol on the GPU itself to clear off that paste gunk before the oven step; I forgot to do this myself. But you’ll need to do it anyway when you put the thing back together; once the GPU and heatsink are separated you can’t reuse the dried paste, so you might as well do it before it goes in the oven. Finally, remove the various paper stickers from the video card itself, and put the heatsink parts aside; you won’t need to do anything else with them until after the bake. The legs aren’t pretty, but they do the trick. 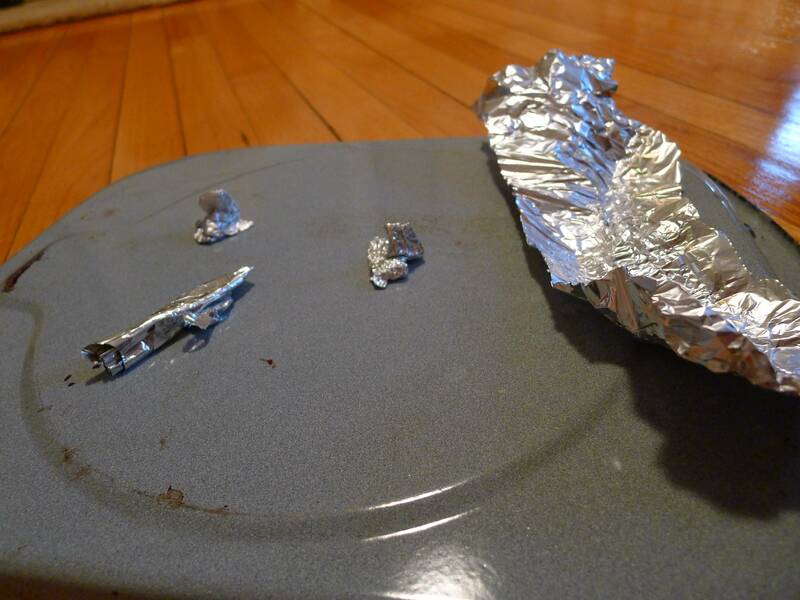 Using 3″ wide and 8″ long strips of aluminum foil rolled into tight tubes, I made four little feet for the card to sit on. I have a small oven so it took me a bit to find something small enough to fit, that I didn’t care about. Circuitry has chemicals and stuff in it; I didn’t want to use my best cookie sheets to do this. I settled on using the bottom side of a 13×9 pan. Then, per the instructions in the original blog post above, I gave the card 300 degrees Fahrenheit for 10 minutes, then took out the card and let it cool. I also opened the kitchen window to hopefully get out any fumes that were left in the oven! It was kind of odd; although I’ve never used that pan for brownies, the kitchen had an odd brownie-like smell to it after I was done. Into the 300 degree oven! I used a bit of Arctic Silver 5 thermal paste on the GPU, about a half-pea-sized dab right in the center. 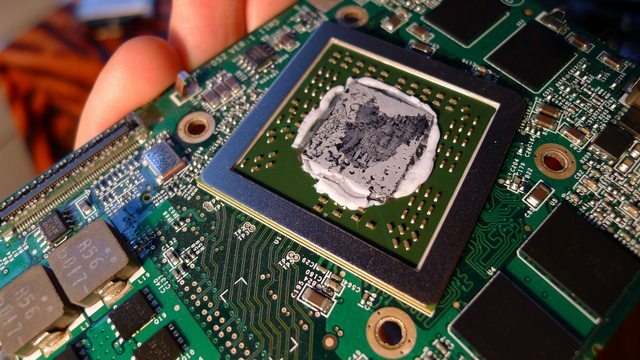 I try not to go overboard with thermal paste; usually a pea is all you need for CPU’s with their own heatsinks on top and a half-pea for GPUs and old-style AMD K9 chips. 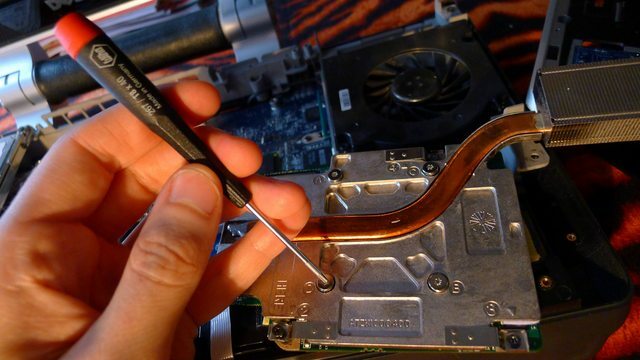 Any more and the actual heatsink might not be able to get as good of contact as it needs; the thermal paste’s job is to be as thin as possible and just fill the little microscopic crevices on the copper and the GPU. Needless to say, I’ve never seen a single OEM manufacturer, from Dell to Apple, get it right. There’s always too much, and it leaks out the sides. And it worked – the machine booted right up. Even though I knew I had a good chance of succeeding, it was still kind of a surprise, as I’ve never baked any circuitry before. I looked into other ways to make the card run cooler than its constant 50-57 degrees Celsius, like undervolting the video card, or overvolting the GPU fan, but there’s not too much data on it. I’ll just have to hope that the superior thermal paste will keep the card from committing suicide again for awhile, but at least now I know it can work! Update July 28, 2014: Unfortunately I apparently didn’t learn my lesson and went back to using the computer on my bed – it’s now having the same problems during boot up again. Looks like I’ll need to do another “bake” when I get around to it. Looking into undervolting the GPU, or revving up the GPU fans, (or even just simply removing that HDD right over the GPU, which I considered earlier already) is going to be essential to keeping the old girl going. If I figure anything out along those lines, I’ll update this post again. 7 people commented on this post - please leave me one, I love getting feedback! Got the same symptoms you indicated this morning, went out and got some arctic silver, baked the board and repasted both the card and CPU ( you’re right, the factory stuff is overdone) it fired right up!! 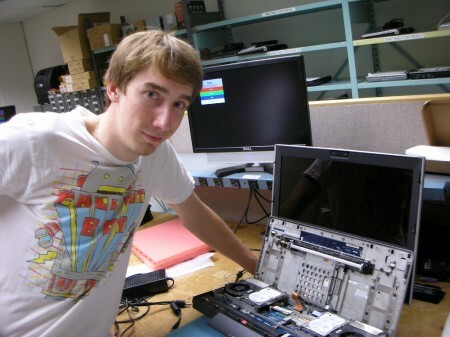 Mine only has the single 160Gb, 7200 rpm drive, but with the 7600 CPU. Was tempted to drop in a SSD though.. While I don’t use this ‘potable workstation’ everyday, I’ve had it since new in 2006 and is more nostalgic for me than anything. Thank you, again, greatly appreciated! 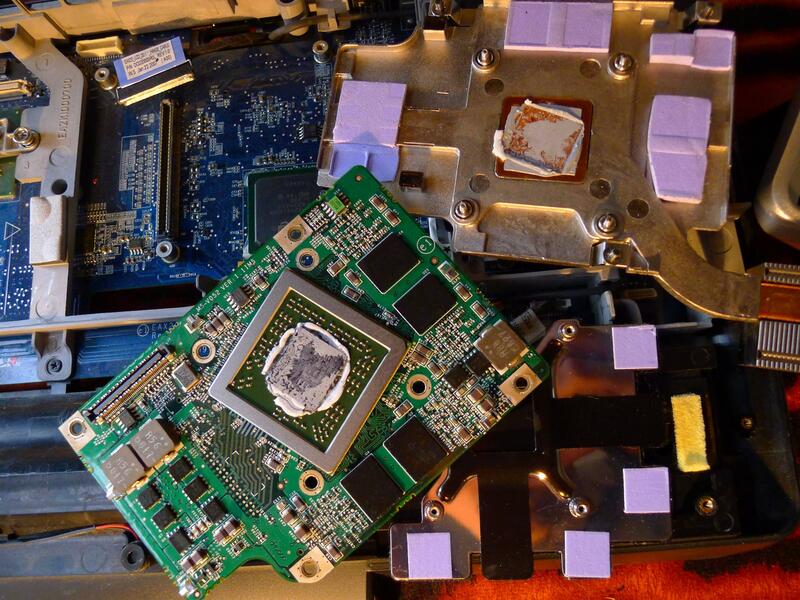 Sorry, I meant ‘Portable Workstation’ …also my family thought I was nuts, baking a circuit board at 300F for 10Min! I love my XPS M2010. But after sending it back to Dell three times to replace the video card (and spending several hundred $$$ on extended warranties) I decided to fix it myself. 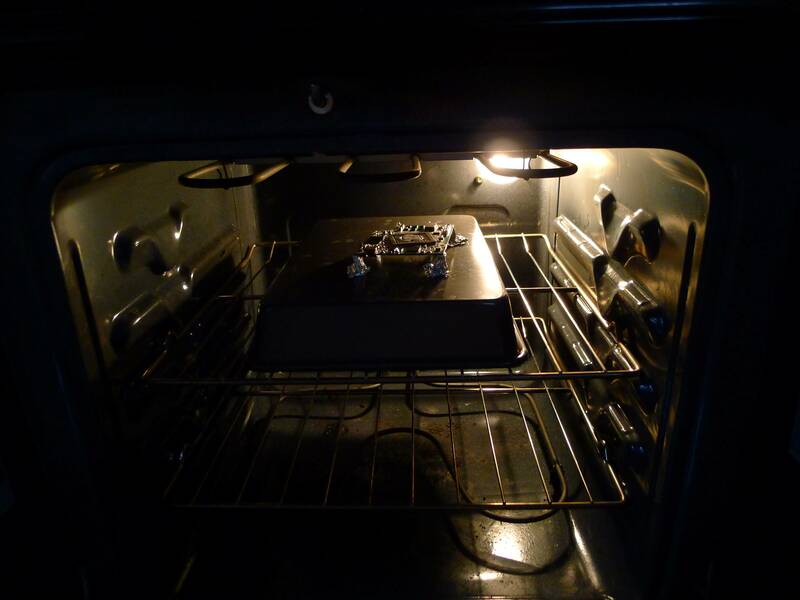 I baked at 300F for 10 minutes and the unit booted right up. The video display isn’t quite perfect but with the extra $$$ in my pocket, I can live with it. Next time I’ll bake a little hotter and a little longer. Now if I can get the damn plastic covers back on, I’ll be really happy. Thanks for the great instructions. My absolute pleasure to help out; that’s why I wrote the blog entry. Be forwarned though; it will have issues again especially when using it on fluffy surfaces like a bedspread. I’m still trying to find ways to underclock both CPU and GPU permanently (I just need it for movies) as a better long-term fix. Have you tried a program that is named Atitool? I successfully changed core and memory speed of the videocard with Atitool 0.2.6. I had the same issue and had done the same steps years ago………it does not matter where you use it…it is the flaw of the design of venting system….. The second ~fourth time…the same, only the duration got shortened….sort of needed more frequent baking…. I had to let go my sad mood and place other cheaper price but good laptop (TOSHIBA Qosmio) to replace its/her/his work………. sad….no one laptop can had the 2.1 sound system like M2010…..M2010 plays LOUD like a TV, making watching video really a fancy thing…..I miss my M2010…..